Making pasta has always been something that I’ve loved doing. My food tech teacher once said that she thought making pasta was one of those things that just wasn’t worth it, but I disagree. When it comes to making tagliatelle or fettuccine I can understand that if you don’t have a pasta roller it’d be annoying to make; rolling pasta dough out by hand is not the most fun thing! Gnocchi on the other hand fall into the spectrum of pasta-type-things-that-I-like-to-put-sauce-on and are really easy to make. 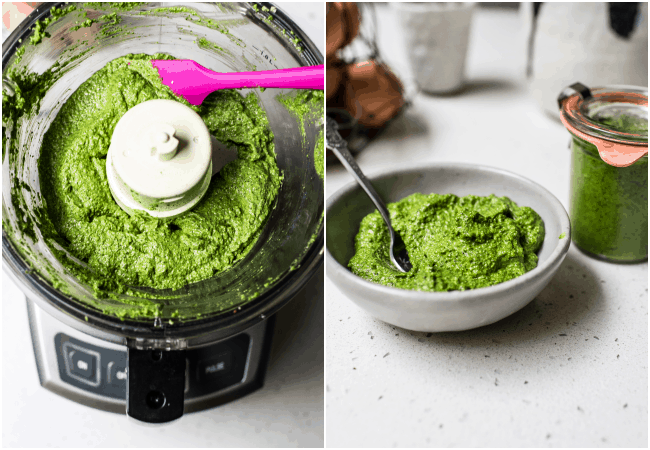 You don’t need a fancy tool for this (you can get a gnocchi board for rolling them on, but I just use a fork) but a food processor does speed things up (Plus you’ll need one for the pesto later)! 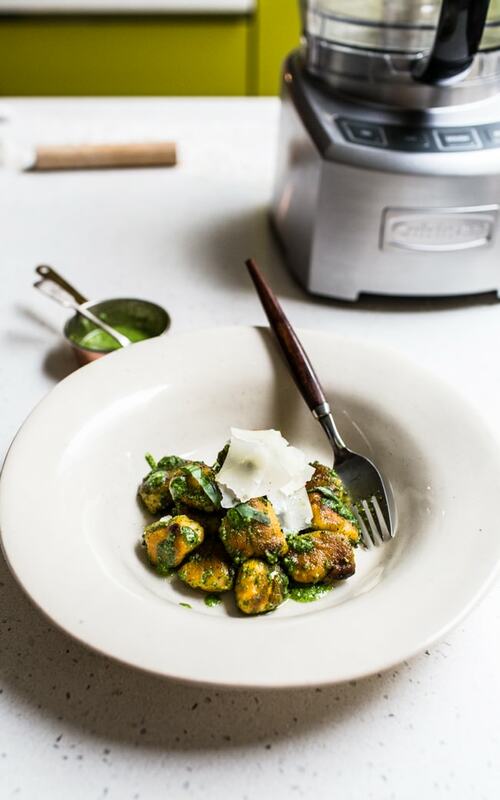 Since I’m collaborating with Cuisinart this month, gnocchi and pesto seemed like an ideal thing to test out. 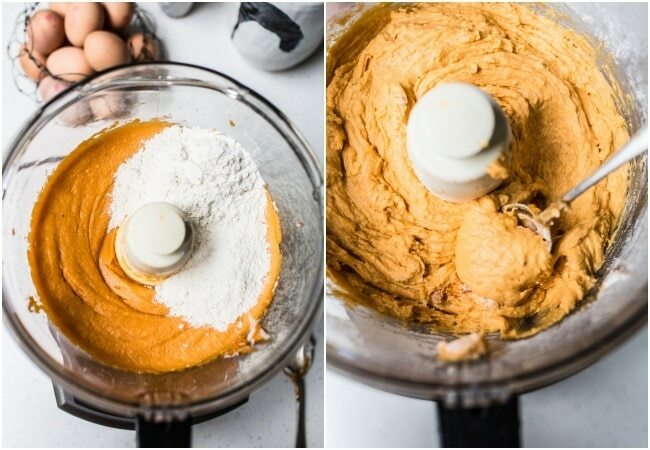 The dough is quite simple to make – roast the sweet potatoes, blend until smooth, blend in the other ingredients. Done. You can mash the potatoes by hand but when you’re dealing with 2 lbs of potatoes that need to be silky smooth, a machine just does is better and faster. In order to make your life easier when shaping this sticky dough you’ll a) need to chill the dough for a couple of hours and b) use a HECK LOAD of flour. Don’t worry if you feel like there’s too much flour on the counter top, it’s probably juuust right! It can take a bit of practice to get into the swing of shaping the gnocchi (spot the fail blobs at the back of the photo below :/ Thanks, Camera for blurring them out!) but to be honest as long as they’re roughly the same size, the shape doesn’t matter very much. The great thing about gnocchi is that once you’ve done your part with the shaping you can freeze them as they can cook straight from frozen in 5 minutes. Those little dumplings are ace as an emergency meal for when you’re having, what my family calls a ‘calorie crisis’ a.k.a extreme hanger. As they’re incredibly filling you’ll barely need to make much else to go with them too – A simple sauce, some veg on the side and you’re sorted! Ever since my friends have gone to uni I’ve heard their lamentations of missing pesto. It’s quite an expensive thing to buy but making it is SO much cheaper and tastier. The priciest component seems to be having to buy ALL OF THE BASIL but I’ve found that actually, you don’t need very much basil at all. Other greens (kale, spinach, wild garlic, chard, broccoli, avocado!) make the bulk while a handful of herbs and some lemon juice bring the flavour. 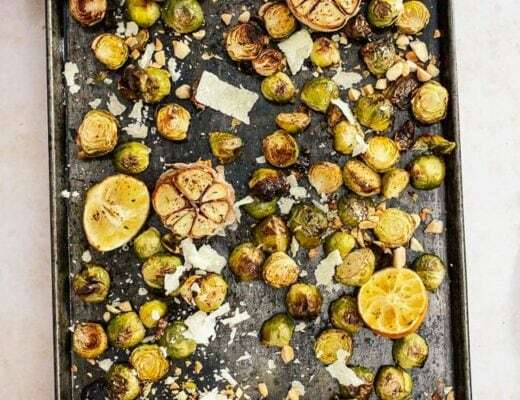 I tend to leave out the parmesan (it doesn’t seem to make loads of difference) and use cashews, walnuts or almonds instead of pine nuts. For about £4 you can make 2 or 3 jars worth of pesto! If you’re feeling like 1/2 cup of olive oil is going to be too spency, cut it with some plain vegetable oil or even water. Using water does mean that the pesto will have slightly less flavour and a looser texture but it still works really well as a cheaper, ‘lighter’ option. I’d just say try to stick to at least 1/4 cup of olive oil and make up the rest with veg oil/water as you see fit. Again this is something which is brilliant to freeze, particularly because it goes mouldy quite easily in the fridge. I scoop it into ice cube trays, freeze and then store the pesto cubes in a sandwich bag in the freezer. Since sage and sweet potato are a classic pairing I used a handful of sage here with a wild garlic base. If you can’t get a hold of wild garlic yet, using spinach with a handful of chives and a clove of garlic make a good substitute. I used the little bowl on my Cuisinart food processor for blending it all up to make a smooth, creamy paste in about a minute. You can use an immersion blender in a small jug to make the pesto but it will take more like 5 minutes to get it smooth. Gnocchi done! Pesto done! All you have to do is plunge those baby dumplings into boiling water for a few minutes, drain and then sauté with pesto. See, we can all make pasta and share the gnocchi love! – For the olive oil in the pesto – you can use half olive oil and half vegetable oil OR half olive oil and half water, to make the pesto a bit cheaper. – Don’t have wild garlic? Use an equal amount of spinach in the pesto and add in a clove of garlic and a handful of chives. 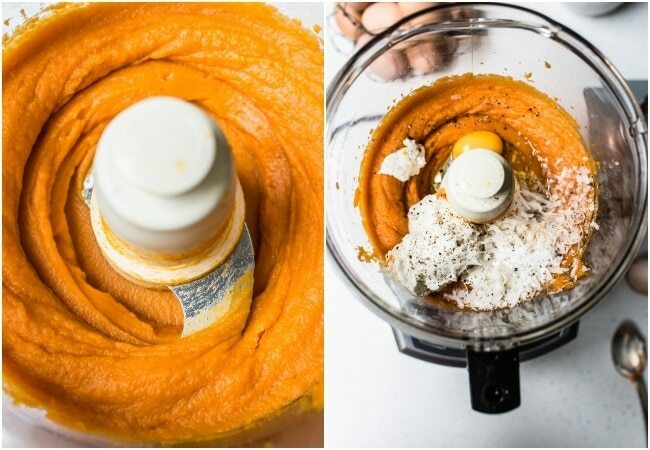 – If you don’t have a food processor – scoop the sweet potato flesh into a pot and mash with a potato masher until as smooth as possible. Then mix in the rest of the ingredients. For the pesto, use a pestle and mortar to grind up the leaves, herbs and nuts, drizzling in oil bit-by-bit until smooth. – To freeze the gnocchi – once shaped, place the whole tray into the freezer for about 2 hours. Transfer the frozen pasta to a sandwich bag and freeze for up to 3 months. To cook the gnocchi from frozen – pour into boiling water and cook for 5 minutes when they should have risen to the surface. Preheat your oven to 400 F (200 C), prick the sweet potatoes all over with a fork and roast on a tray in the oven for 45 minutes until tender. Once roasted, cut the hot potatoes in half and leave them to cool. Scoop out the cooled flesh and place into a food processor, blend until smooth. Add the ricotta, parmesan, salt, pepper, nutmeg and egg then blend again. Add the flour and blend in until just combined. Chill the dough for at least 2 hours before shaping. Generously sprinkle a clean work surface and a baking tray with flour. Take a quarter of the chilled dough and place onto the work surface, spirnkling with more flour to coat. Use your hands to roll the dough into a long rope about 1-inch thick, adding more flour as needed to stop it sticking. Cut the dough into 1-inch pieces. Take one piece and, using your thumb, push into + down the tines of a floured fork so that the dough becomes ridged and curls in on itself, then place onto the floured baking tray. Repeat with all of the gnocchi dough. Chill or freeze until needed (see notes). Bring a large pot of water to the boil and season generously with salt. Pour the gnocchi in and cook for 2-3 minutes if chilled or 4-5 minutes if frozen. You can tell when the gnocchi are done as they will float once cooked. 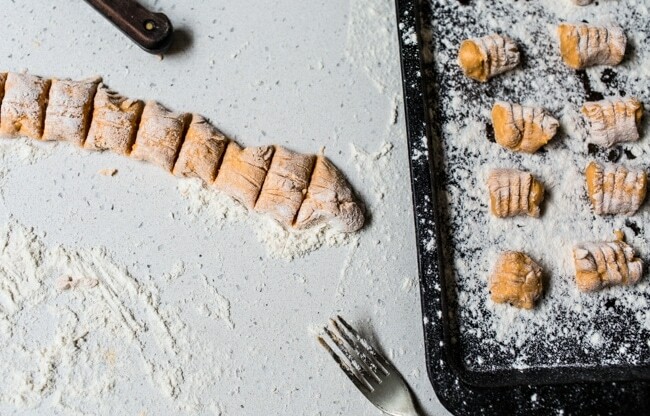 Drain the gnocchi (reserve a bit of the pasta water) and rinse them, set aside as you prep the frying pan: Melt a knob of butter in a non-stick frying pan over a medium-high heat. Once sizzling, add the gnocchi and sauté for a few minutes until browned. Spoon in the pesto and stir to coat, adding a splash of the pasta water if needed to loosen the sauce. Transfer to 4 plates and serve with shredded basil and shaved parmesan. I love making pasta as well. Started a few years ago when we got a pasta attachment. And I am totally on board with making gnocchi in the food processor. Definitely speeds things up. And I’ll take a bowl of that pesto, please! Looks/sounds absolutely delicious! Gnocchi are a favorite in my family. We definitely don’t make them as often as we should. 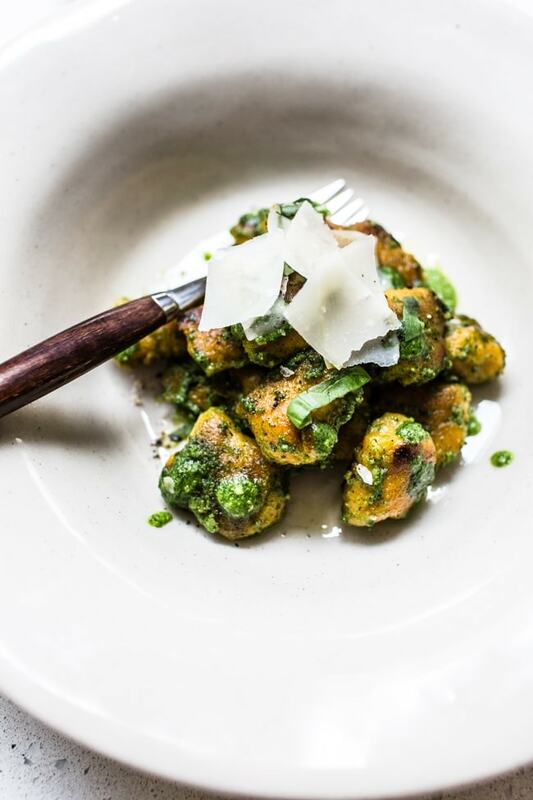 And we DEFINITELY need to try sweet potato gnocchi!! I made a similar recipe in my blog months ago ^_^ I’m sure your gnocchi are awesome!!! I’m sad to admit that I’ve only made gnocchi at home once but now I’m dying to try it again! Oh, and that sage pesto is so happening! I like to make pesto as often as possible but I’ve never tried it with sage! For me the pine nuts are just so crazy expensive. I imagine cashews would have a similar-ish taste but not sure? Maybe walnuts? yeah they really are pricey! I use cashews most of the time (like with the pesto here) and I’ve never noticed a difference in flavour between them and the pine nuts! I just have a question, how do you set up/type up your own recipes on your blog with the print button? I love making gnocchi and I love making pesto so this is perfect. Wild garlic sounds so delicious! I used to be on Team Not Worth It, but then I had fresh pasta made at home and switched to Team I Get It. 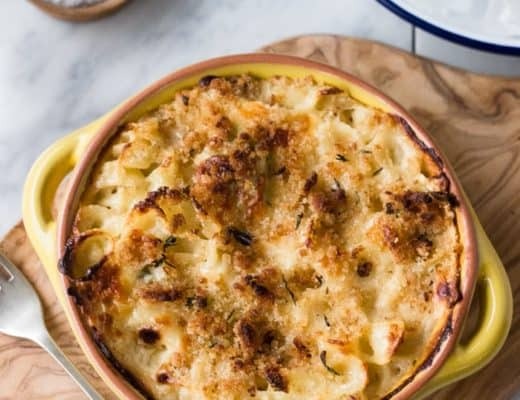 Can’t wait to try this gnocchi recipe, it looks absolutely delish! I’ve never made fresh pasta. You recipe just inspired me. Thanks! This looks incredible! I’ve never made gnocchi before, but I am going to try this out! This is everything i want in a meal and more! delish! Delicious, one of my favourite dishes in the universe! I’ve only ever actually made it once, years ago: you’ve inspired me! I only discovered the magic of home-made pasta since I found out how damn simple it was. I like how I can change the colours and flavours of the dish to suit my mood. Also It never hurts to have frozen pasta on hand. Magical combination Izy! Lovely recipe and gorgeous pics. Thanks for sharing. looks so vibrant and delicious. a culinary genius! Yes yes yes!! Everything about this is pure perfection, Izy! Those little creamsicle puffs, the sage, the pesto, it all sounds so good (and is making me super hungry right now). Love this! IZY. Wow. I have no other words other than per.fec.tion. Seriously, this whole combo can’t be made any better!! I made my own pasta(!!) on Valentine’s Day and it was SO yummy – can’t wait to try to make these! I think you might have messed up on the notes – should it say wild garlic instead of wild sage? Homemade pasta is always worth it! haha yep, thanks for letting me know 🙂 Corrected now! As I will be a student soon (is there really only 6 months till September?) – this is one of the most best blog posts ever!!!! THISSS. So fancy and beauteous! The flavors, the colors. The making-of pictures. I could watch that GIF forever. Literally. Pinning this! These look amazing! That garlic sage pesto looks so delicious! This looks amazing!! Reminds me of one of my favorite meals at TJs. I just watched an episode of Two Greedy Italians where they made gnocchi using chestnut flour, heritage potatoes through a potato ricer, and one giant duck egg. Boiled for a minute or so, and then straight into a pan with a foraged mushroom sauce. I’ve definitely had gnocchi on the brain since then…and now your recipe has inspired me even more! Delicious! Oh my gosh this looks amazing!! 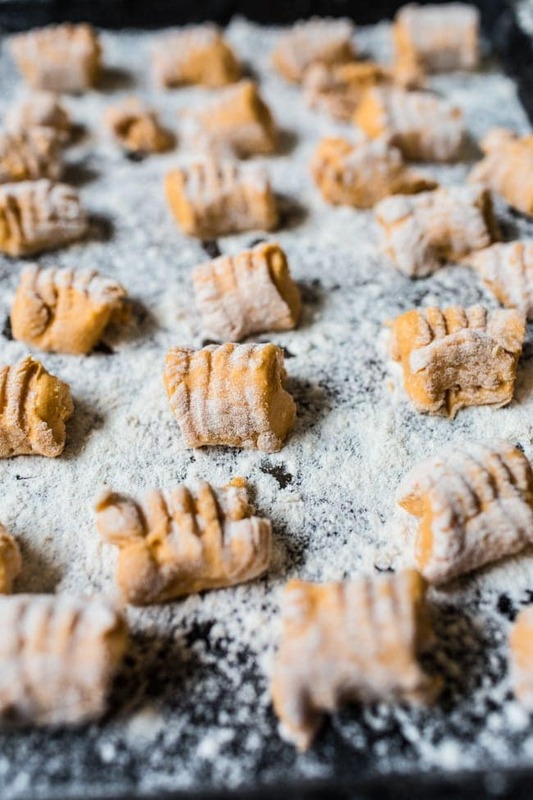 I love the video of you rolling the gnocchi too–very helpful! Going to give this a try! So excited to try this recipe!!! This looks amazing and love the sound of this gorgeous dairy free pesto! I am loving the sage and sweet potato combination! And I am also loving your gorgeous photos! How many serving is this recipe? Izyyyy i made these the other night and they were amazing! to me, sweet potatoes > everything. Gnocchi is so much easier, it has become something I do on the reg.. who would have thought. I made this last night and OH MY GOD it was insanely delicious. I’ve only made gnocchi once before (about five years ago) and it was a total disaster and I ended up with waterlogged mashed potato in a sieve, but these worked perfectly. New favourite – better stock up on wild garlic! 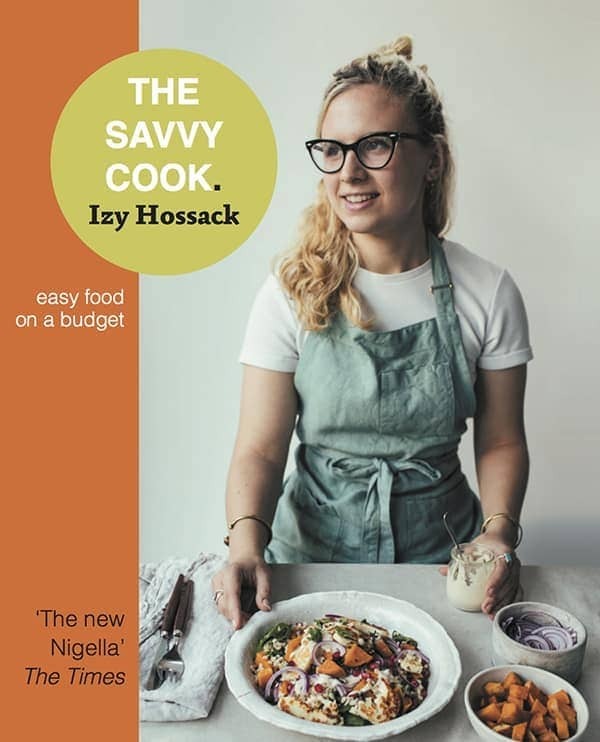 Hi Izzy, Love the sound of your recipe but have one hiccup with it – I need a flour that is not wheat, potato or soy – do you have any idea what might work as a replacement? I have a question Izzy. For someone who is allergic to nuts – is there a way to make a nut-free pesto? I know it’s not going to be the exact same, but would love your input.